On the 3rd (Fri), make an unforgettable trip to Happily Ever After Fireworks. To find reviews, other places to visit, more things to do, and more tourist information, use the Orlando route site . Paris, France to Orlando is an approximately 13.5-hour flight. You can also do a combination of flight and bus; or do a combination of flight and shuttle. The time zone difference moving from Central European Time to Eastern Standard Time is minus 6 hours. When traveling from Paris in May, plan for much warmer days and somewhat warmer nights in Orlando: temperatures range from 36°C by day to 24°C at night. Wrap up your sightseeing on the 4th (Sat) early enough to drive to Miami Beach. 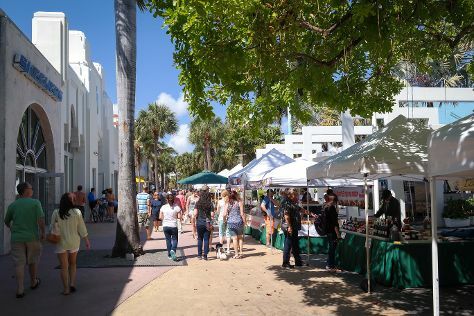 Start off your visit on the 5th (Sun): buy something for everyone on your list at Lincoln Road, take a stroll through Ocean Drive, then get to know the fascinating history of Art Deco Historic District, and finally enjoy the sand and surf at South Beach. On the next day, wander the streets of Collins Avenue, then examine the collection at Vizcaya Museum and Gardens, and then enjoy the sand and surf at Fort Lauderdale Beach. For reviews, other places to visit, traveler tips, and more tourist information, you can read our Miami Beach road trip planning website . Drive from Orlando to Miami Beach in 4 hours. Alternatively, you can take a bus; or take a train. In May, daytime highs in Miami Beach are 36°C, while nighttime lows are 27°C. Finish your sightseeing early on the 6th (Mon) to allow enough time to drive to Key Largo. Kick off your visit on the 7th (Tue): look for all kinds of wild species at Florida Keys Wild Bird Rehabilitation Center, see some colorful creatures with a scuba or snorkeling tour, and then identify plant and animal life at Anhinga Trail. Get ready for a full day of sightseeing on the 8th (Wed): admire all the interesting features of Spiegel Grove, then identify plant and animal life at Molasses Reef, and then immerse yourself in nature at John Pennekamp Coral Reef State Park. To find photos, other places to visit, traveler tips, and tourist information, read Key Largo online route planner . Traveling by car from Miami Beach to Key Largo takes 1.5 hours. Alternatively, you can take a bus. In May, daytime highs in Key Largo are 34°C, while nighttime lows are 26°C. Wrap up your sightseeing on the 8th (Wed) early enough to drive to Islamorada. On the 9th (Thu), view the masterpieces at Michelle Nicole Lowe Art Gallery, get to know the fascinating history of Indian Key State Historic Site, then kick back and relax at Anne's Beach, and finally see what you can catch with a fishing tour. You can drive from Key Largo to Islamorada in an hour. Alternatively, you can do a combination of taxi and bus. May in Islamorada sees daily highs of 36°C and lows of 29°C at night. Finish up your sightseeing early on the 9th (Thu) so you can catcht the bus to Key West. Get in touch with nature at Fort Zachary Taylor and Dolphin & Whale Watching. Get some cultural insight at The Ernest Hemingway Home and Museum and Curry Mansion. And it doesn't end there: steep yourself in history at Truman Little White House, visit a coastal fixture at Key West Lighthouse and Keeper's Quarters Museum, take a memorable tour with Tours, and take in the architecture and atmosphere at Saint Mary Star of the Sea. For photos, more things to do, reviews, and other tourist information, you can read our Key West road trip planning site . Getting from Islamorada to Key West by bus takes about 2 hours. Other options: drive. In May, plan for daily highs up to 34°C, and evening lows to 29°C. Cap off your sightseeing on the 12th (Sun) early enough to catcht the bus to Marathon. On the 13th (Mon), kick back and relax at Sombrero Beach, then identify plant and animal life at Crane Point Museum & Nature Center, then identify plant and animal life at National Key Deer Refuge, and finally immerse yourself in nature at Bahia Honda State Park. On the next day, identify plant and animal life at Dolphin Research Center, then take in the architecture and atmosphere at San Pablo Catholic Church, then identify plant and animal life at The Turtle Hospital, and finally look for all kinds of wild species at Pigeon Key Foundation. For where to stay, photos, and tourist information, refer to the Marathon route planner . Traveling by bus from Key West to Marathon takes 1.5 hours. Alternatively, you can drive. In May in Marathon, expect temperatures between 36°C during the day and 29°C at night. Finish your sightseeing early on the 14th (Tue) to allow enough time to travel back home. Sarasota is a city in Sarasota County on the southwestern coast of the U.S. Kick off your visit on the 15th (Wed): appreciate the extensive heritage of Marie Selby Botanical Gardens, then take a memorable tour with Tours, then pause for some serene contemplation at St. Jude the Apostle Cathedral Church, and finally see the interesting displays at The Dali Museum. On the 16th (Thu), you'll have a packed day of sightseeing: stroll the grounds of Sarasota National Cemetery, take a memorable drive along Myakka River State Park, then tour the pleasant surroundings at Siesta Beach, and finally paddle through the water with a kayaking and canoeing tour. For ratings, reviews, where to stay, and other tourist information, use the Sarasota itinerary maker site . Traveling by car from Marathon to Sarasota takes 6 hours. Alternatively, you can do a combination of bus and flight; or do a combination of shuttle, flight, and bus. Traveling from Marathon in May, plan for little chillier nights in Sarasota, with lows around 23°C. Wrap up your sightseeing by early afternoon on the 17th (Fri) to allow time for travel back home.